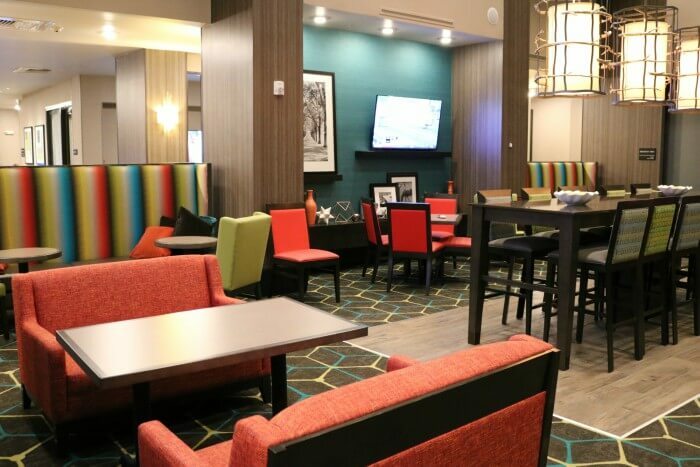 The Hampton Inn and Suites in Newport, Kentucky offers easy access to Cincinnati, Ohio and close proximity to Newport on the Levee, Newport’s hub of things to do. 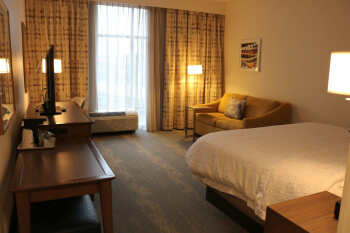 Plus, the views of Cincinnati and the Ohio River from the Hampton Inn are stunning, particularly as the sun is setting. 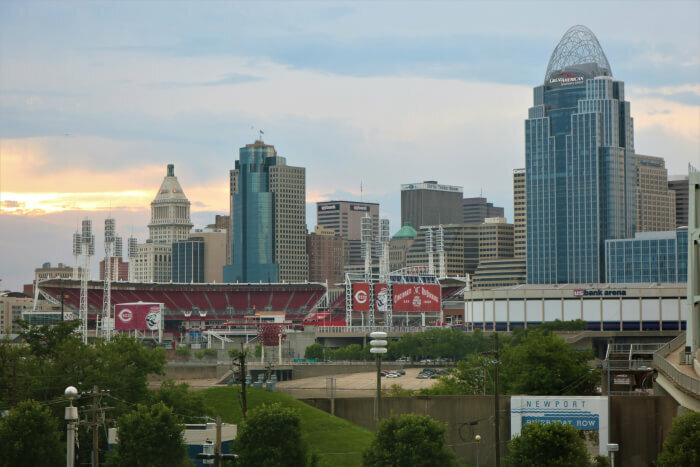 Access to Cincinnati is as easy as walking across the Southbank Bridge which connects Newport on the Levee with downtown Cincinnati, in particular, The Great American Ball Park where the Cincinnati Reds play and Paul Brown Stadium, home of the Bengals. Whether you stay on the Kentucky side or head to Cincinnati, there’s much to see without ever needing your car. 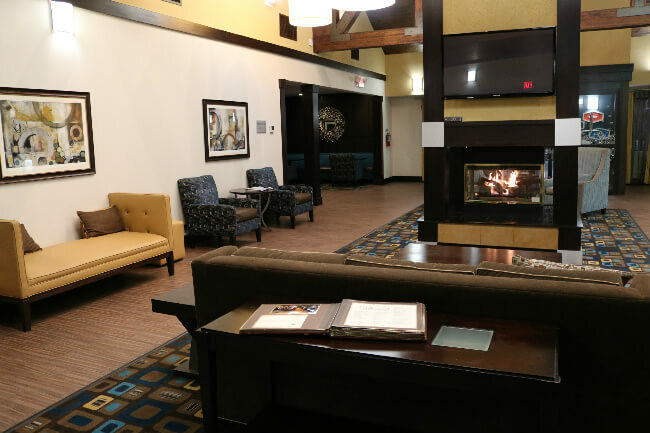 Although the Hampton Inn and Suites is within walking distance to nightlife, its at the edge of the commercial section so the surroundings are quiet. When a group of us sat outside on the patio visiting at night, we were mostly on our own except for a couple of people heading back into the hotel. Earlier that evening, we walked the few blocks to the Hofbrauhaus , a German beerhall style restaurant in Newport known for its German eats, beer and live music. 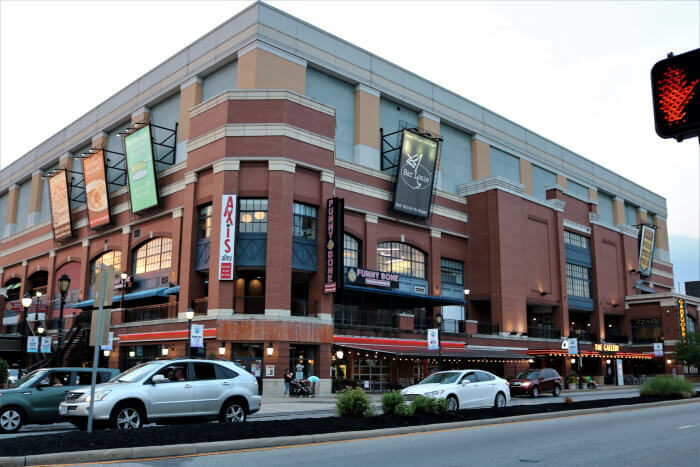 The walk led past the Newport Aquarium, and the levee complex with an AMC theater and restaurants. Being able to walk to the Hofbrauhaus saved a few bucks since parking was $5. Parking at the Hampton Inn is free and plentiful. From making reservations over the phone in order to get the three guest rooms to every encounter I had with staff during our stay, the staff was pleasant and incredibly helpful. The day we were to arrive, someone from reservations called me to see if I would be willing to switch one of the room types for a lower rate. The hotel was booked solid and needed to do some juggling. There wasn’t pressure to switch rooms, but I was happy to oblige as long as I had a Cincinnati and river view. One room was switched from the king bed/sofa bed combo to two queen beds which also worked out fine for the people staying there. My room, a king bed with a sofa bed worked well for my son and me. The yellow highlights of the sofa and artwork created a cheerful, stylish tone. When the sofa bed was pulled out there was still plenty of room to use the desk. The bathroom had a walk-in shower and was impeccably clean. I wish we were able to stay for one more night in order to take in more of the area offering and enjoy the hotel’s ambiance a bit longer. We did hang out in the lounge area that doubled as the breakfast space in the morning. 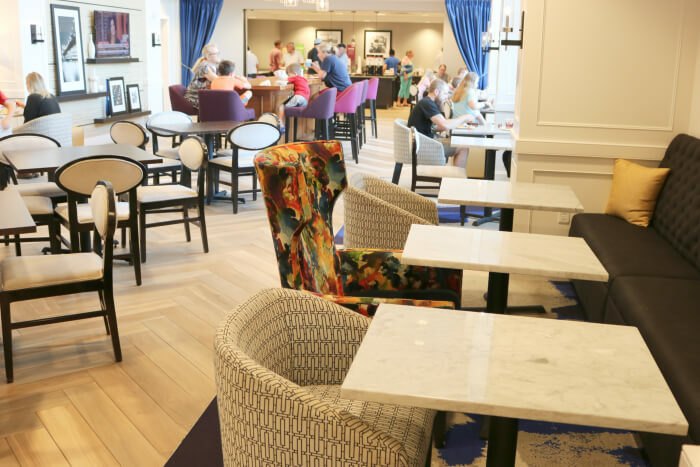 Like the guest rooms, the décor in the lounge is stylish and cheerful. Whoever picked out fabric patterns for furniture and carpeting has an eye for textures and colors that create a mood of fun. Plus, during breakfast, there was plenty of seating and hot and cold food items to keep guests happy. Although the kiosk connected to the reception area doesn’t sell beer or wine, there is a liquor store cattycorner across the street. This came in handy for a couple of my cousins who had libations out on the patio. When two of us used the business center for the computers and the printer, we discovered the printer was putting out blank pages. The reception desk attendant replaced the toner cartridge within minutes. Having a technical problem that was fixed promptly with a smile was a relief and appreciated. 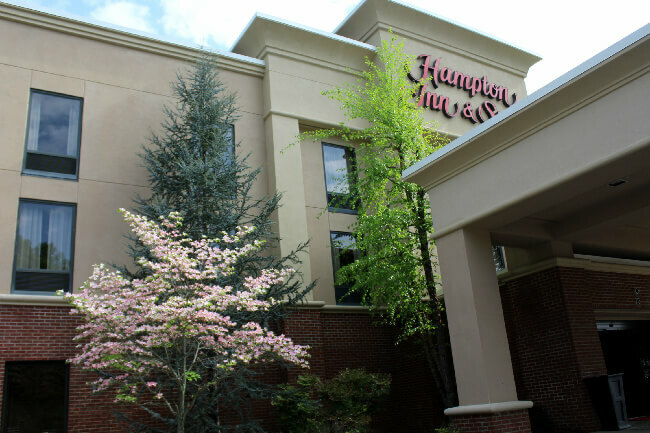 The Hampton Inn and Suites in Newport also has a well-kept pool and exercise room. Wi-Fi is free. Some rooms come with refrigerators. Rooms could have a bathtub or a shower, so when you book, check out the options. Some rooms are handicapped accessible. Room rates from website currently run from $399 to $436, however my rate in May was a little over $200 including tax. 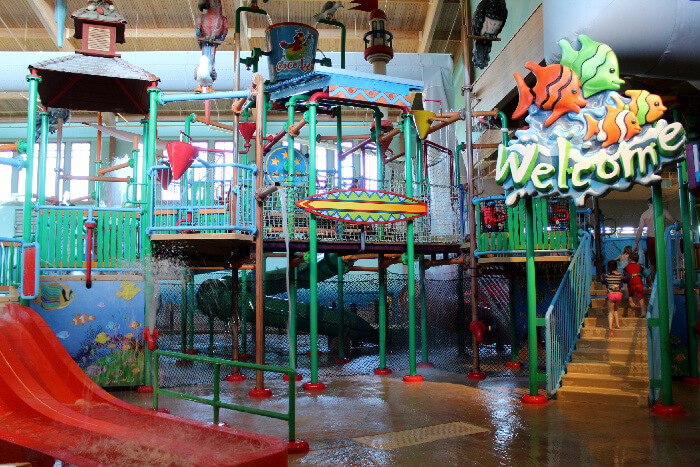 Rates vary depending upon what is happening in Cincinnati or Newport. Try Travelocity or Expedia for an even lower rate. 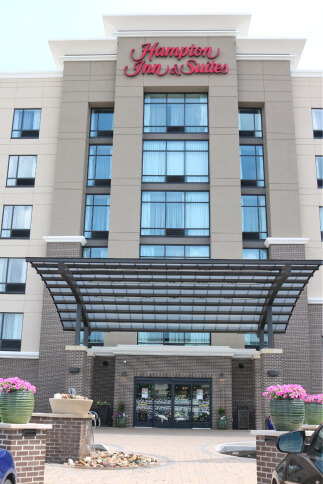 If the hotel is booked through the website call the reservation desk at 859/415-0678 because a room may be available. This is why I went through the reservation desk.